Thank you Swim Zip, Rad Swim and Kortni Jeane for sending sending the swimwear reviewed below. As always the opinions expressed here are 100% my own. Izzy and I LOVE twinning! I’ve rounded up 3 swimsuit shops you MUST check out for this summer and I’m going to compare each unique style they have. This company creates swimwear that is super functional. Raise your hand if pulling wet swimwear over your child(s) head is fun… Ya I didn’t think so. The zipper makes it super easy to undress your babe who just had fun in the sun and water. Best of all and such a unique characteristic is that Swim Zip swimwear is UV protectant with UPF 50+ SPF fabric. You may not find swim bottoms for yourself, but the rash guard swim shirts are simply amazing! You can chose from dresses, short sleeved, long sleeved, full length and cropped. I’m wearing the Womens Essential Swim Dress Cover Up (SPF UV UPF 50+). 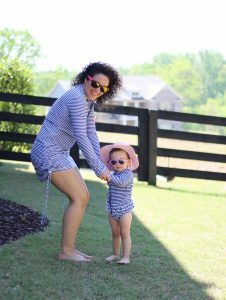 Izzy is wearing the Baby Girl Long Sleeve Rash Guard Swimsuit Set (SPF UV UPF 50+). You can find Izzy’s Sun Hat at Swim Zip as well. 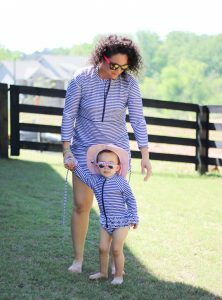 Beyond the swim wear their sister company Shēdo Lane (a clothing company for the whole family) offers UPF 50+ protection which blocks 98% of UVA and UVB cancer causing rays. How does the sizing run? For Izzy true to size, she is wearing a 24 months. I’m wearing a medium top (which is loose because I sized up). I didn’t want a tight fit. If you want a tighter fit then pick your normal top size. I like it bigger, giving me the option to layer with it. This shop specializes in allowing you to personalize your look from color, to pattern and style. You chose your top and bottom, who doesn’t like to mix and match? They have mens and mini men styles as well. To me Kortni Jeane as a retro kind of feel to it. I’m currently obsessed with the high waisted bottoms that can hide my mommy tummy. I’m wearing the Sweetheart Peplum Top & the High Waisted Bottoms. Izzy is wearing the same top as me with the All Ruffled Up Bottoms. How does the sizing run? For Izzy true to size, she is wearing a 2T. I’m wearing a medium top and bottom. I usually size up in swimwear though. This company really has some rad swimwear. 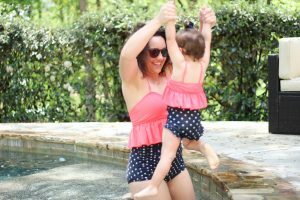 I had a mommy and me set last year from Rad Swim and loved them as much as I love our new tankinis. Izzy picked the purple for us, but our suits also come in black and pink. Shop my Hallie Tankini here. 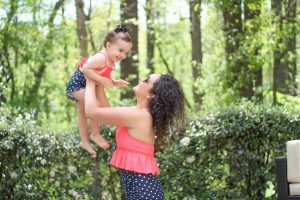 Shop Izzy’s Hallie Tankini here. If you are looking for solids, florals, sparkles or scalloped edges then check out Rad Swim. This company has an adult, tween and a little girls line. Every piece has a really fun characteristic to it. For example with our swimwear they took a plain tankini and added ties and scalloped edges. These little details are what make their swimwear truly rad! They don’t just have swimwear though. They also have adorable cover ups, hats and more. I hope reviewing these three companies helped you in your decision making for swimwear this summer. Happy shopping friends! Previous Post 4 Reasons to STOP asking when a woman is having kids. Love all of these suits! So many cute summertime options. Oh my gosh! These are too cute! Ohhh I’m crushing hard on all of these suits! I absolutely love Swim Zip! The SPF protection is incredible! OMG – too cute! I already LOVE SwimZip, but need to also try out these other companies!